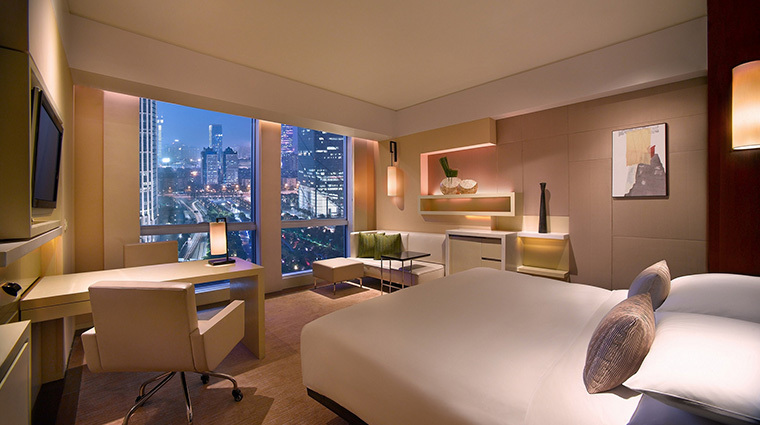 One of the most prominent business hotels in town, Grand Hyatt Guangzhou employs a crowd-pleasing recipe: Zen interiors, a convenient location, great service and several dining options. 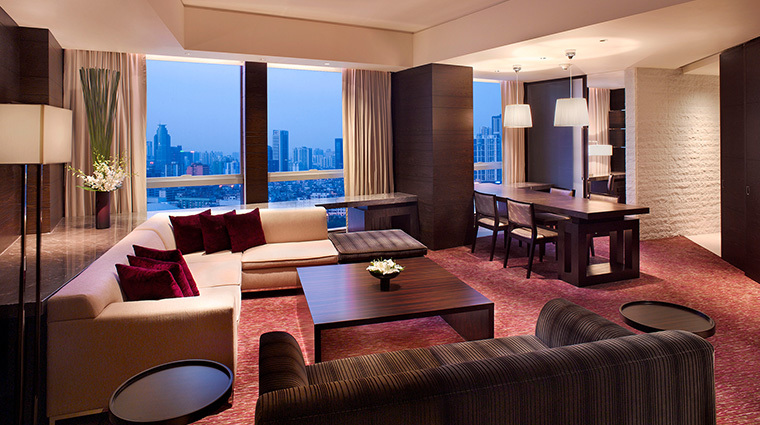 For both business and leisure travelers to Guangdong Province, the refined hotel is a reliable place to stay with plenty of extras, including a spa, a sky-high lounge with killer views and an indoor rooftop pool. 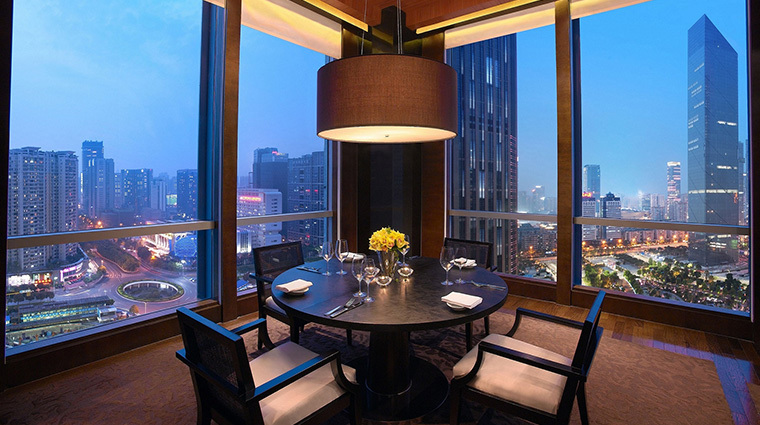 • Grand Hyatt Guangzhou makes quite a first impression with its panoramic views over Guangzhou from the Sky Lobby on the 22nd floor. 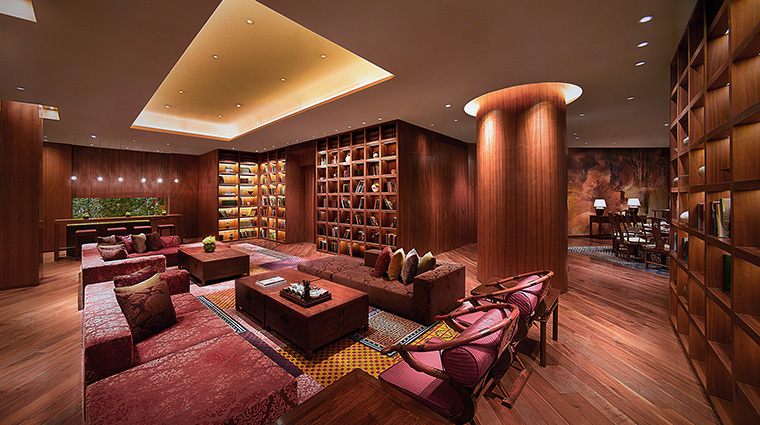 • Despite being one of the most popular business hotels in the city, the stylish address still retains a calming sense of Zen, thanks in part to Japanese-inspired interiors by Remedios Studio, which also worked on Grand Hyatt Tokyo. 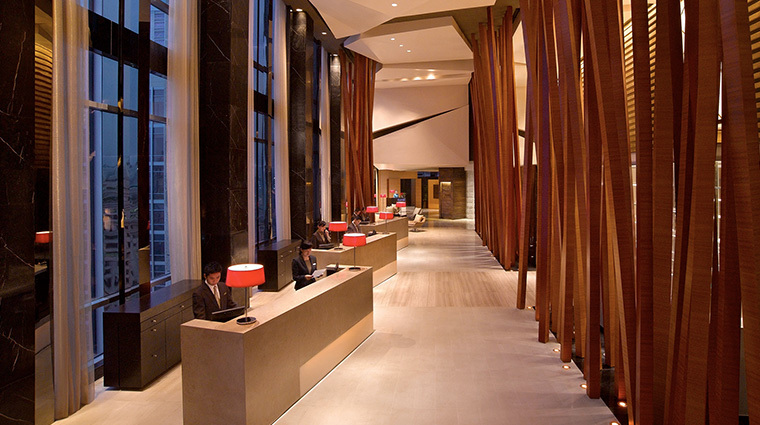 • Around the lobby and peppered throughout the Guangzhou hotel you’ll find elements of bamboo, dark wood furnishings, natural materials like rock and glass, as well as soft, glowing lighting. 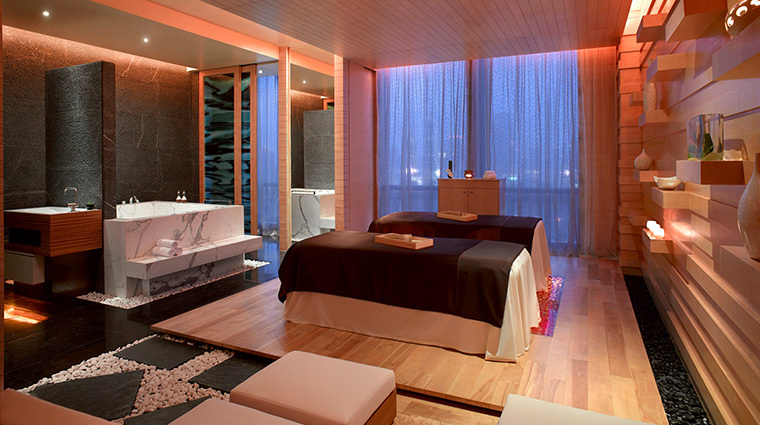 • After checking in at the large wood reception desk, follow the stone pathways down dark wood corridors into a peaceful and nature-inspired treatment room. 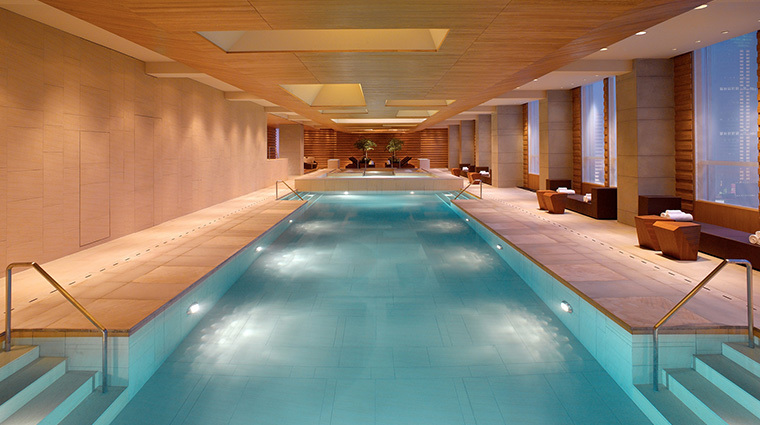 • Health enthusiasts will appreciate the 82-foot lap pool, a fully equipped gym, whirlpool, sauna and cold plunge pool facilities. 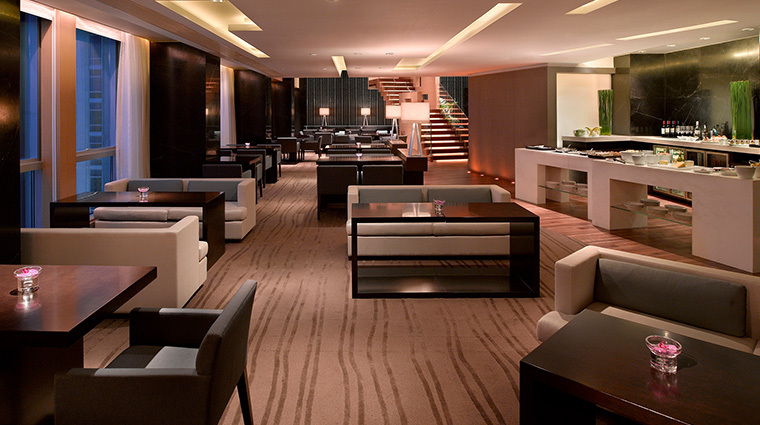 • If you’re here on business, splurging for access to the Grand Club lounge is worth it. 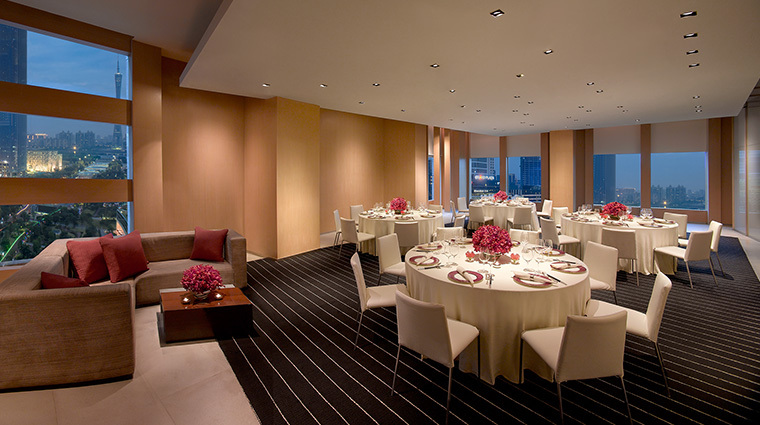 The 20th-floor venue offers a peaceful place to work, hold a meeting or unwind at the complimentary cocktail hour. 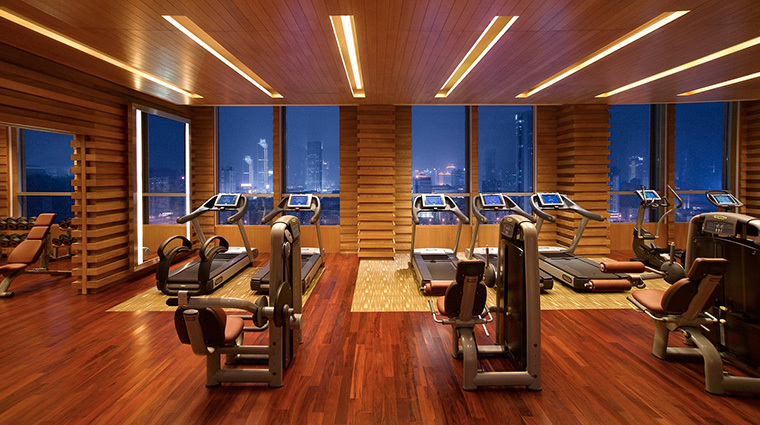 • Daytime visits will reward spa goers with impressive views of the Pearl River New City — you can see all the way to Baiyun Mountain on a clear day. 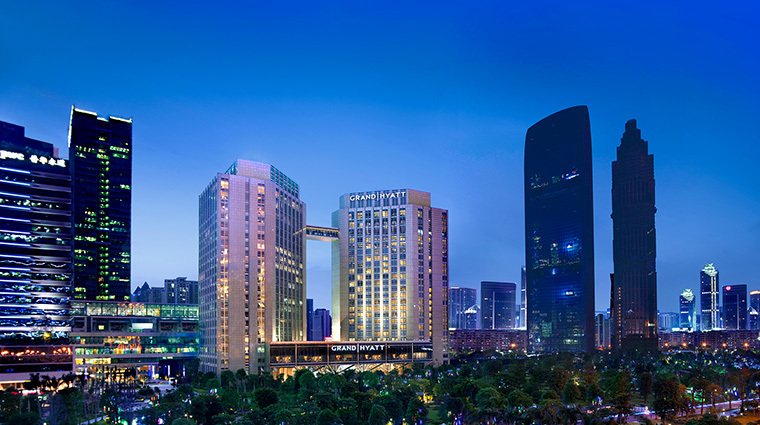 • In the heart of Guangzhou’s business district, the hip hotel is within walking distance to all of the major commercial areas and conference centers in the Pearl River New Town, including the biannual Canton Fair, which usually takes place in October and May each year. 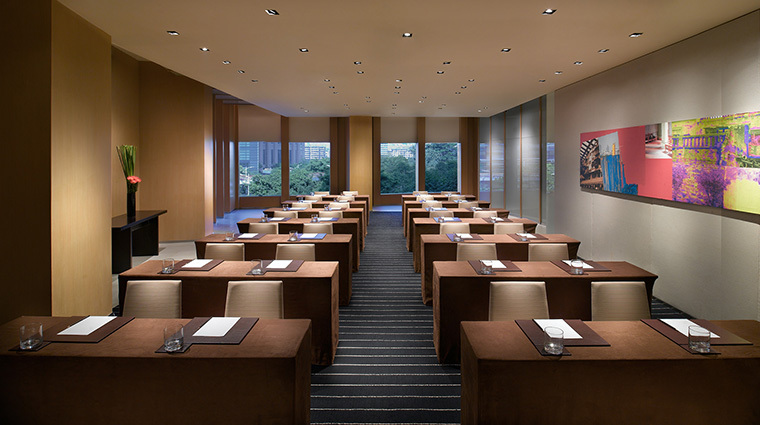 • It’s also about a block away from a Guangzhou Metro, near a sprawling green park and about a 15-minute drive from the city’s main train station. • In keeping with the Japanese aesthetic, rooms have a minimalist feel with a clean white, beige and brown color scheme. 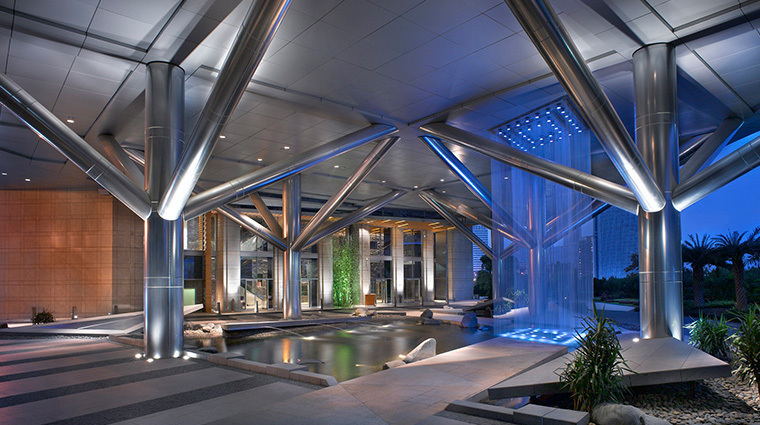 • You’ll encounter contemporary art on the walls, floor-to-ceiling windows, a working desk, iPod dock and a 37-inch LCD flat-screen TV that pulls out from the wall so you can watch from any angle. • In the airy bathroom, there’s a handy island countertop stocked with June Jacobs lotions and soaps, as well as a glass shower that acts as a divider between the bathroom and the bedroom — higher room categories come with a Japanese-style deep, square tub that’s designed to facilitate good circulation. 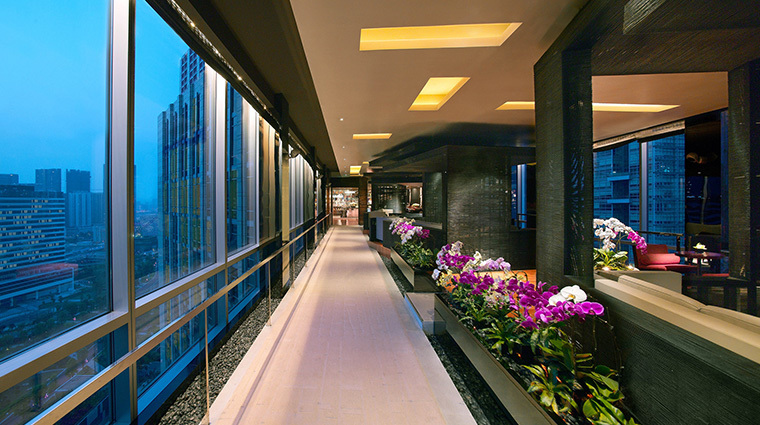 • Diplomats, government officials and bigwigs have made appearances at The Penthouse, which as its name suggests, is perched on the top floor of the luxury hotel. 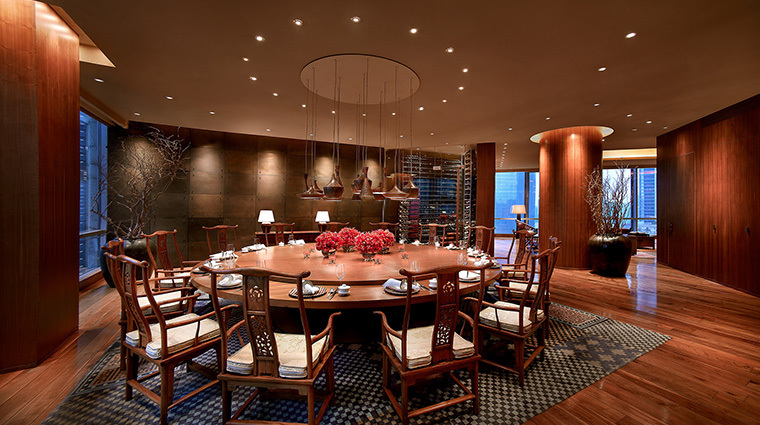 • The Cantonese restaurant comprises 13 private dining suites, all of which look like they’re straight out of a Shanghai mansion — butlers and all. • For more informal dining, try The Market Café, where dozens of open-kitchen stations cook up food from all over the world, including Chinese soups, tempura, lamb chops, pizza and fresh seafood. • Brace yourself for crowds, as this place is popular with hotel guests and local diners alike. 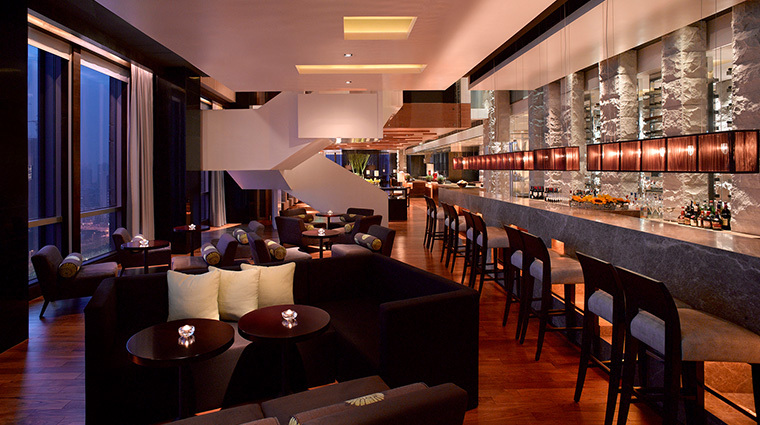 • Swanky, contemporary G Restaurant is known for its wood-fired grilled steak, walk-in wine cellar and panoramic city views.